Trinity River electric guitar. 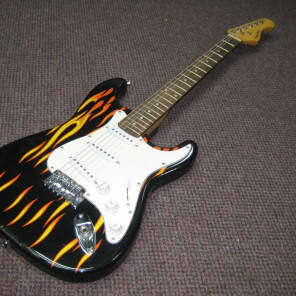 This guitar has a flame top with a white 3 ply pick guard. There are 3 single coil pickups controlled by 1 volume knob, 2 tone knobs and a 5 way selector switch. It has a rose wood fret board with 22 frets. This is an excellent playing guitar. This is a pre-owned guitar. It does has several minor surface scratches.